"At the former Verona apartments, now condos, the least expensive one-bedroom unit in the back facing the wall of the adjacent building is $400,000. One could rent a luxury apartment at $3000 a month for 133 years for that amount. A buyer who puts $50,000 down and borrows $350,000 has monthly payments of about $2500, including taxes and condo fees. Over the first five years little of this goes into equity. The same buyer could rent an apartment at Glenbrook with gardens, exercise facilities, etc. for $1000 a month and put the other $1500 in savings. After five years, the individual has saved $90,000 and if invested even at a modest 5 percent, accumulated a $115,000 nest egg"
Let us see what we have after two year of paying mortgage for condo. As I already mentioned in article about Villagio in Cupertino the Montebello Cupertino condo complex was initially constructed as 425 units Verona apartments between 2003 and 2004. The apartment complex was almost immediately converted to condo complex by builder and owner Prometheus Real Estate Company. Let's compare renter and mortgage payer. One started to rent one bedroom in Glenbrook apartment and second bought one bedroom condo for $400,000 in converted Verona apartments two year ago in the summer of 2004. After two year renter lost $33,600 and home owner lost only 32,925. The one bedroom condo in Montebello Cupertino costs around $475,000 today. It means the lucky condo owner would get around $60,000 after selling and as result we have renter who lost $33,600 and buyer who earned almost $30,000 for the same time. The condos may be a reasonable investment for those who can afford them and renting is almost always loss in Cupertino. Recently I took a picture in front of condos and you can see how many wise condo owners started to get hefty profit after paying mortgage for two years. the lucky owner made $30k, but is that net-net? what about sale commissions and income tax? 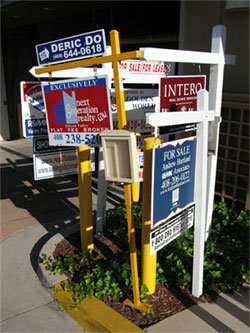 There are real estate companies on market which charge not six percent commission, but a flat fee to advertise a home for sale, provide yard signs, advise on the offering price, negotiate with potential buyers and guide the sale through closing. As for income tax you can exclude from federal income tax up to $250,000 ($500,000 if you're married and file a joint return) of any capital gain that results from the sale of your principal residence, regardless of your age. In general, an individual, or either spouse in a married couple, can use this exclusion only once every two years. To qualify for the exclusion, you must have owned and used the home as your principal residence for a total of two out of the five years before the sale.